Also serving communities of Herington. The average cost of assisted living in Abilene is $2,900 per month. This is lower than the national median of $3,346. To help you with your search, browse the 2 reviews below for assisted living facilities in Abilene. On average, consumers rate assisted living in Abilene 5.0 out of 5 stars. Caring.com has helped thousands of families find high-quality senior care. To speak with one of our Family Advisors about assisted living options and costs in Abilene, call (855) 863-8283. Seniors who decide to move into assisted living in Abilene are joining a community with a rich, storied past and present. Wild Bill Hickok was once the town's marshal and today, Abilene is home to the only professional live theater between Denver and Kansas City. Abilene's senior population is also thriving, with people aged 65 and older making up over a fifth of the city's more than 6,000 residents. To serve seniors who need personal care services, Abilene offers two assisted living communities. 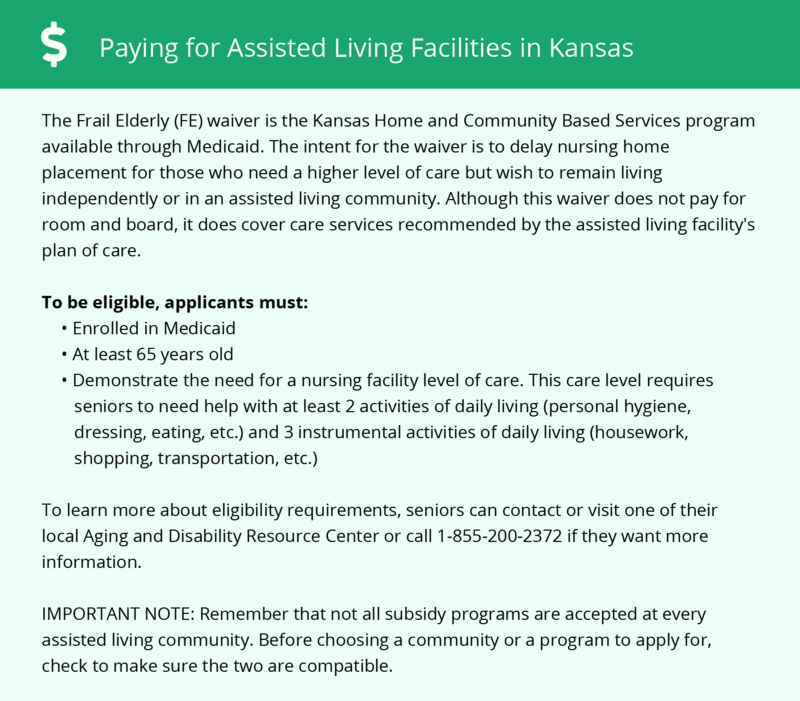 Kansas State's Secretary of Aging and Disability Services may license them under several different names, including Assisted Living Facilities and Residential Health Care Facilities. When organizing outings for seniors in Abilene, assisted living facilities can choose destinations from among the city's many landmarks and historical sites. Possible day trips include visits to the Great Plains Theatre, the Seelye Mansion or the Five Star Museum District, which is home to the Eisenhower Presidential Library and Museum. Living costs can vary significantly from one city to the next and may impact a senior's budget for assisted living. On a scale where the average U.S. cost of living is 100, Abilene scores 80. Overall, Abilene's cost of living is 10 percent cheaper than the state average and 20 percent cheaper than the national average. The Abilene area is home to world-class medical facilities, including Memorial Hospital, in the event of medical emergencies or illness. Abilene's seniors may be able to take advantage of state tax breaks to boost their savings for assisted living. For example, retirees with adjusted gross incomes of less than $75,000 a year don't have to pay taxes on their Social Security retirement income. Public pensions and railroad retirement benefits are also tax-free, although other kinds of retirement income, such as 401(k) plan withdrawals, are taxable. City of Abilene General Public Transportation offers mainly curb-to-curb and demand-response transit within a 6-mile radius of Abilene. To schedule a ride, seniors in assisted living facilities should call at least 24 hours in advance. Sun-worshipping seniors will appreciate Abilene's climate, which averages 225 sunshiny days annually, compared to the U.S. average of only 205. Assisted Living costs in Abilene start around $2,900 per month on average, while the nationwide average cost of assisted living is $4,000 per month, according to the latest figures from Genworth’s Cost of Care Survey. 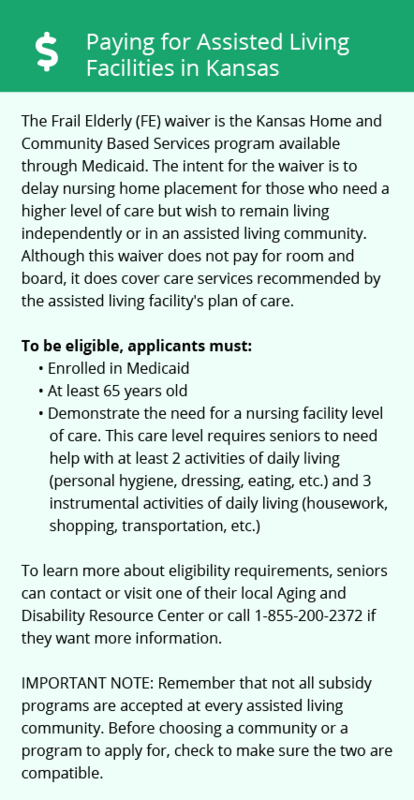 KanCare, Kansas State's Medicaid program, offers one waiver to assist qualifying seniors with assisted living costs. Called the Frail Elder Waiver Program, it can help eligible seniors pay for direct care services. Note, however, that it does not cover room and board. To see a list of free assisted living resources in Abilene, please visit our Assisted Living in Kansas page. Abilene-area assisted living communities must adhere to the comprehensive set of state laws and regulations that all assisted living communities in Kansas are required to follow. Visit our Assisted Living in Kansas page for more information about these laws.